Only countries that have signed the World Heritage Convention, pledging to protect their natural and cultural heritage, can submit nomination proposals for properties on their territory to be considered for inclusion in UNESCO’s World Heritage List. The first step a country must take is to make an ‘inventory' of its important natural and cultural heritage sites located within its boundaries. This ‘inventory' is known as the Tentative List, and provides a forecast of the properties that a State Party may decide to submit for inscription in the next five to ten years and which may be updated at any time. It is an important step since the World Heritage Committee cannot consider a nomination for inscription on the World Heritage List unless the property has already been included on the State Party's Tentative List. By preparing a Tentative List and selecting sites from it, a State Party can plan when to present a nomination file. The World Heritage Centre offers advice and assistance to the State Party in preparing this file, which needs to be as exhaustive as possible, making sure the necessary documentation and maps are included. The nomination is submitted to the World Heritage Centre for review and to check it is complete. Once a nomination file is complete the World Heritage Centre sends it to the appropriate Advisory Bodies for evaluation. A nominated property is independently evaluated by two Advisory Bodies mandated by the World Heritage Convention: the International Council on Monuments and Sites (ICOMOS) and the International Union for Conservation of Nature (IUCN), which respectively provide the World Heritage Committee with evaluations of the cultural and natural sites nominated. The third Advisory Body is the International Centre for the Study of the Preservation and Restoration of Cultural Property (ICCROM), an intergovernmental organization which provides the Committee with expert advice on conservation of cultural sites, as well as on training activities. Once a site has been nominated and evaluated, it is up to the intergovernmental World Heritage Committee to make the final decision on its inscription. Once a year, the Committee meets to decide which sites will be inscribed on the World Heritage List. It can also defer its decision and request further information on sites from the States Parties. To be included on the World Heritage List, sites must be of outstanding universal value and meet at least one out of ten selection criteria. These criteria are explained in the Operational Guidelines for the Implementation of the World Heritage Convention which, besides the text of the Convention, is the main working tool on World Heritage. The criteria are regularly revised by the Committee to reflect the evolution of the World Heritage concept itself. Until the end of 2004, World Heritage sites were selected on the basis of six cultural and four natural criteria. With the adoption of the revised Operational Guidelines, only one set of ten criteria exists. 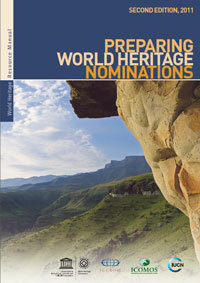 Nominations may be submitted at any time during the year, but only those nominations that are "complete" (see paragraph 132) and received by the Secretariat on or before 1st February* will be considered for inscription on the World Heritage List by the World Heritage Committee during the following year. Deadline*: 1st February of the year preceding the one in which the approval of the Committee is requested. Deadline*: 1st February of the year in which the approval of the Committee is requested. Deadline: The original signed version of the completed Factual Errors submission form should be received in English or French by the UNESCO World Heritage Centre, no later than 14 days before the opening of the session of the Committee. Retrospective Inventory and "boundary clarifications"
b) the extent to which the nominations presented at its 30th session (2006) contribute to the aim of a representative World Heritage List. Requests the World Heritage Centre to ensure that all future publications of the World Heritage List indicate the criteria according to which properties were inscribed on the List using the new numbering system for the combined criteria (i) to (x). VI.1 The Committee noted the reports of the following four reform groups and sincerely thanked the States Parties who had participated in their work. The Committee recalled that the Task Force for the Implementation of the Convention, chaired by Ms Christina Cameron (Canada), had proposed that sub-committees be established to facilitate the work of the World Heritage Committee and the World Heritage Centre. The Committee also recalled that the twenty-fourth session of the Bureau (June 2000) had requested that there be further examination of the possibility of a sub-committee system and that the Special Session of the Bureau (Budapest, 2-4 October 2000) had discussed the proposal further with reference to a paper prepared by the United Kingdom. As requested by the Special Session of the Bureau, a paper on the feasibility and implications of a sub-committee system was prepared and examined by the twenty-fourth extraordinary session of the Bureau (WHC-2000/CONF.203/6). Objective 4 Increase representation of States Parties in the work of the Committee. The revised deadline for nominations would be 1 February. Evaluations would be due from IUCN and/or ICOMOS 6 weeks prior to the April Bureau. Referrals of nominations would be re-examined by the Bureau in the year following initial examination before proceeding to the Committee for decision. The deadline for receipt of international assistance requests and state of conservation reports would also be on 1 February. The Committee decided to defer a decision on the introduction of a sub-committee system or the extension of the Bureau session from six to eight days, until the effectiveness of the other reforms (changed statutory meeting calendar and cycle, limitation in number of nominations to be examined each year and reforms to meeting documentation) could be assessed at a later date. It was thus agreed that reform should proceed gradually. Greater efforts were to be given to structuring the work of the Bureau to focus its work. The ordering of the agenda by topics was considered useful as was the use of informal ad hoc working groups to expedite the work of the Bureau and Committee. The Delegate of Hungary presented a document distributed to the Committee entitled "A Hungarian World Heritage Vision". The document refers to the need to address the balance of representation of the World Heritage List in favour of under- represented or non-represented countries. It also calls for a more prominent role for tentative lists. The Delegate of Hungary suggested that with a pause in the examination of nominations in 2002, the twenty-sixth session of the Committee in 2002 could concentrate on the preparation of a Strategic Plan and other issues important for the future implementation of the Convention. The Committee noted that the Task Force on the Implementation of the World Heritage Convention had recommended a number of reforms to the documents prepared for World Heritage statutory meetings. all other documents as Information Documents. continue to prepare a Secretariat Report to the Bureau and Committee but improve its structure and content. The Committee requested the World Heritage Centre to implement as many of these reforms as are feasible before the twenty-fifth session of the Committee. requested the World Heritage Committee to submit proposals on this matter to the thirteenth General Assembly of States Parties and to inscribe an item on the agenda of the thirty-first General Conference in 2001. The Committee noted that in 2000, a Working Group on Equitable Representation within the World Heritage Committee was established under the Chairmanship of H.E. Ambassador J. Musitelli (France). The report of the Working Group was discussed at the June and October 2000 sessions of the Bureau (WHC-2000/CONF.204/INF.9). A certain number of seats may be reserved for State Parties who do not have sites on the World Heritage List, upon decision of the World Heritage Committee at the session that precedes the General Assembly. Such a ballot for reserved seats would precede the open ballot for the remaining seats to be filled. Unsuccessful candidates in the reserved ballot would be eligible to stand in the open ballot. 13.8 Those States obtaining in the first ballot the required majority shall be elected, unless the number of States obtaining that majority is greater than the number of seats to be filled. In that case, the States obtaining the greatest number of votes, up to the number of seats to be filled, shall be declared elected. If the number of States obtaining the majority required is less than the number of seats to be filled, there shall be a second ballot, followed by a third and, if necessary a fourth, to fill the remaining seats. If the number of States obtaining the majority required is less than the number of seats to be filled, there shall be a second ballot. If the number of States obtaining the majority required is still less than the number of seats to be filled there shall be a third and, if necessary a fourth ballot, to fill the remaining seats. For the third and fourth ballots, the voting shall be restricted to the States obtaining the greatest number of votes in the previous ballot, up to a number twice that of the seats remaining to be filled. Decides that this resolution should be implemented immediately. The Committee also recommended that the General Assembly organize the agenda of its thirteenth session so that the measures foreseen by these amendments may enter into force at that same session. In order to implement the new rule to be inserted following Rule 13.1, the Committee decided that one seat be reserved for a State Party not having a site inscribed on the World Heritage List at the date of the thirteenth session of the General Assembly. The Committee requested the Secretariat to inform all States Parties of the implementation of the new electoral procedures, particularly those States Parties which may fulfill the conditions to be candidates for the reserved seat. The Committee requested the Secretariat to prepare with the involvement of interested States Parties and the advisory bodies, a proposal for the twenty-sixth session of the World Heritage Committee for further amendment to Rule 13 of the Rules of Procedures of the General Assembly relating to the election of members of the World Heritage Committee in order to ensure an equitable representation of the different regions and cultures of the world. This proposal is to be based on a thorough analysis of the consequences of the proposed changes and the adjustments that would be required to the election procedures. "In determining the place of the next session, the Committee shall give due regard to the need to ensure an equitable rotation among the different regions and cultures of the world." "In appointing consultative bodies, due regard shall be given to the need to ensure an equitable representation of the different regions and cultures of the world." "In appointing subsidiary bodies, due regard shall be given to the need to ensure an equitable representation of the different regions and cultures of the world." The Committee examined and discussed the recommendations of the Working Group on the Representivity of the World Heritage List chaired by Ambassador Yai (Benin), which had been transmitted by the Special Session of the Bureau with some changes. The Committee recognized that the issue of representivity of the World Heritage List was the most difficult of the reform issues under consideration by the Committee. The Committee noted that more effective use of tentative lists and greater regulation of the ever-increasing number of nominations was required. It was agreed that other measures, such as assistance for capacity-building would be vital for ensuring the representation of sites from all regions on the World Heritage List. With reference to Section 3, the Delegate of Hungary asked that his request for a change in the deadline for submission of nominations to be examined in 2002, from December 2000 as agreed by the Committee, to April 2001, be noted in the Report. The Committee agreed to note this request by the Delegate of Hungary but stated that in the interest of a smooth transition, the majority position of the Committee will be maintained. With the exception of Hungary, the text of the decision was adopted by all members of the Committee. A letter from the Italian Government is included as Annex IX of this report. The Committee agreed to transmit its decision to the Thirteenth General Assembly of States Parties in 2001. (ii) The States Parties undertake, in accordance with the provisions of this Convention, to give their help in the identification, protection, conservation and presentation of the cultural and natural heritage . . . if the States on whose territory it is situated so request (Article 6 (2)). (iii) Every State Party to this Convention shall, in so far as possible, submit to the World Heritage Committee an inventory of property forming part of the cultural and natural heritage, situated in its territory and suitable for inclusion in the list . . . (Article 11 (1). Decisive cooperative action is required by the Committee and States Parties to ensure that the World Heritage List is fully representative of the world's natural and cultural heritage. (i) In the future, consistent with Article 11, .the tentative lists of cultural and natural sites should be used, as a planning tool to reduce the imbalances in the World Heritage List. States Parties are reminded of the invitation to submit tentative lists in conformity with Article 11 of the Convention. The Committee should revise paragraphs 7 and 8 of the Operational Guidelines to extend to natural sites its decision not to examine nominations of sites for inscription if the property does not appear on a tentative list. (ii) The advisory bodies and the World Heritage Centre should proceed with an analysis of sites inscribed on the World Heritage List and the tentative list on a regional, chronological, geographical and thematic basis. This analysis should be undertaken as soon as possible, taking into account the workload on advisory bodies and the financial implications of this work, particularly in regard to the large number of sites on the tentative list. For this reason, the work should be undertaken in two parts, sites inscribed on the World Heritage List and sites on the tentative list. The analysis will provide States Parties with a clear overview of the present situation, and likely trends in the short to medium term with a view to identifying under-represented categories. The recommendations of the regional and thematic meetings on the harmonisation of tentative lists held since 1984 and those on the Global Strategy organised since 1994. (iv) The World Heritage Centre and advisory bodies should communicate the results of the analyses to the World Heritage Committee and, following the Committee's examination, the results should be conveyed to States Parties to the Convention, together with the Committee's recommendations. This will allow them to prepare, revise and/or harmonise their tentative list, taking into account, where appropriate, regional considerations, and to take the results of the analyses into consideration for the submission of future nominations. (v) The results of the analyses should be communicated no later than 30 September 2001. In order to promote the effective management of the increasing size of the World Heritage List, the Committee at each ordinary session will set the maximum number of nominations to be considered. In the first instance and on an interim basis, it is proposed that at the twenty-seventh session of the Committee in 2003, the number of nominations examined by the Committee will be limited to a maximum of 30 new sites. In order to determine which sites should be given priority for consideration, all nominations to be considered at the twenty- seventh session of the Committee must be received in full by the new due date of 1 February 2002 agreed by the Committee as part of the change of cycle of meetings. No State Parties should submit more than one nomination, except those States Parties that have no sites inscribed on the World Heritage List who will have the opportunity to propose two or three nominations. When applying this priority system, date of receipt of full and complete nominations by the World Heritage Centre shall be used as the secondary determining factor within the category where the number of nominations established by the Committee is reached. In addition to the approved maximum number of sites, the Committee will also consider nominations deferred, or referred, from previous meetings and changes to the boundaries of already inscribed properties. The Committee may also decide to consider, on an emergency basis, situations falling under paragraph 67 of the Operational Guidelines. No change to existing system. Full and complete nominations received by the World Heritage Centre prior to 31 December 2000 will be considered together with nominations deferred, or referred, from previous meetings and changes to the boundaries of already inscribed properties. The Committee may also decide to consider, on an emergency basis, situations falling under paragraph 67 of the Operational Guidelines. 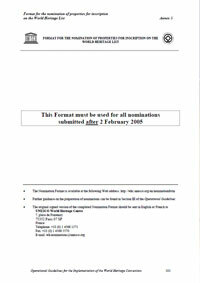 Nominations to be submitted by 1 February 2002 and prioritized in accordance with the system as described above. The system described above is to be reviewed by the Committee after two full years of operation. by deciding, on a voluntary basis, to suspend the presentation of new nominations. iii) Give priority to the re-examination of their tentative lists within the framework of regional consultations and to the preparation of periodic reports. (i) The World Heritage Centre should continue to promote training programmes, preferably at the regional level, aimed at allowing States Parties whose heritage is still under-represented to be better versed in the Convention and to better implement the measures under Article 5. These primarily concern the identification, management, protection, enhancement and conservation of heritage. Such programmes should also assist States Parties to acquire and/or consolidate their expertise, in the preparation and harmonisation of their tentative lists and the preparation of nominations. (ii) The advisory bodies and the World Heritage Centre should use the opportunity of evaluation missions to hold regional training workshops to assist under-represented States in the methods of preparation of their tentative list and nominations. Appropriate financial and human resources should be provided through the World Heritage Centre budget process to undertake such workshops. (iii) Requests by States Parties whose heritage is non- represented or under-represented should be given a high priority when the portion of the World Heritage budget relating to Preparatory Assistance in preparing nominations is developed. The necessity of giving priority to the least developed countries (LDCs) and countries with a low revenue. (v) Regional Plans of Action should be updated and developed within the framework of the Global Strategy. These should specify for each targeted region and State Party, the objective, action needed, responsibility, timetable for adoption, state of play and a mechanism to report on progress in implementing these at each session of the World Heritage Committee. In order to underline their incentive nature, the Plans of Action should highlight the actions by the States Parties concerned, notably in application of Article 5 of the Convention, and should mention the bilateral or multilateral co-operation programmes in the field of heritage in general, for the elaboration in particular of nominations. (vi) The next UNESCO Medium-Term Strategy should stress the necessity of adopting an intersectoral policy aimed at better implementing the Convention. From the 2002-2003 biennium, an intersectoral project should be developed and implemented to encourage the States Parties whose heritage is still under- represented to reinforce their capacity to protect, conserve and enhance it. The Committee noted that the Hungarian authorities had prepared a proposal for the establishment of a Heritage Partnership Programme to be examined by the Committee at its twenty-fourth session in Cairns (WHC-2000/CONF.204/19). The Committee decided that a review of the implementation and effectiveness of such measures should take place not later than 2003. The Director of the World Heritage Centre thanked English Heritage and the Government of the United Kingdom for having organized, jointly with the UNESCO World Heritage Centre, the International Expert Meeting on the Revision to the Operational Guidelines in Canterbury, England, from 10 to 14 April, 2000. He also thanked the Government of the United Kingdom for having offered to provide an additional financial contribution to this important activity in 2001. Following a report on the results of the Expert Meeting by Christopher Young (United Kingdom), who had chaired the meeting, the Committee decided that the Operational Guidelines be restructured according to the proposed new overall framework (WHC-2000/CONF.204/INF.10). The Committee requested that the Operational Guidelines be simplified, streamlined and presented in a user-friendly form with most of the existing and new supporting material to be moved to annexes and other documentation. The Committee asked that the Operational Guidelines be organized in a logical way, returning to the fundamental principles of the World Heritage Convention. The revised Operational Guidelines will introduce for the first time a consolidated section on the Protection and Conservation of World Heritage Properties. More creative use of tentative lists. The Committee decided that the process for revising the Operational Guidelines should be co-ordinated by the World Heritage Centre through a collaborative process involving representatives of States Parties, the advisory bodies and the Secretariat. It was agreed that revised Operational Guidelines should reflect different regional and cultural perspectives. The Committee agreed to the following phased approach to the revision of the Operational Guidelines. The Director of the World Heritage Centre noted that additional human and financial resources would be required for the Centre to co-ordinate this process. Phase VI Submission of revised Operational Guidelines to the twenty-fifth session of the World Heritage Committee in 2001 for decision. 1Full and complete nominations received by the World Heritage Centre prior to 31 December 2000 will be considered together with nominations deferred, or referred, from previous meetings and changes to the boundaries of already inscribed properties. The Committee may also decide to consider, on an emergency basis, situations falling under paragraph 67 of the Operational Guidelines. 3 In evaluating these, and all other nominations, the Advisory Bodies should continue to apply a strict evaluation of criteria as set out in the Operational Guidelines. XVII.1 The Committee took note of the revisions to the Operational Guidelines which were proposed by the Expert Meeting on Evaluation of general principles and criteria for nominations of natural World Heritage sites (Pare national de la Vanoise, France, 22 to 24 March 1996) and of the full report contained in Information Document WHC-96/CONF.201/INF.8, as well as the responses by eleven States Parties to the Circular Letter requesting comments on this matter. XVII.2 The Delegate of Canada proposed to keep the Vanoise recommendations as well as comments by States Parties on record and bring them up at the joint meeting of cultural and natural heritage experts proposed under agenda item 9 "Progress report on the Global Strategy, and Thematic and Comparative Studies". The Delegate of Lebanon emphasized that these recommendations should not be brought from one expert meeting to another, but to the twenty-first session of the World Heritage Committee. The Committee has adopted at its twentieth session substantive Explanatory Notes to the above nomination form. These notes relate to each of the above headings and will be made available as an annex to the nomination form to the States Parties in order to provide guidance to those nominating properties for inclusion on the World Heritage List." "All requests for international assistance which are to be examined by the Bureau, with the exception of requests for emergency assistance, should be submitted before 1 May and 1 September respectively for consideration by the following session of the Bureau. Large-scale requests (that is those exceeding US$ 30,000) will be forwarded, with the Bureau's recommendation, to the following session of the World Heritage Committee for decision-making." "be directly or tangibly associated with events or living traditions, with ideas, or with beliefs, with artistic and literary works of outstanding universal significance (the Committee considers that this criterion should justify inclusion in the List only in exceptional circumstances and in conjunction with other criteria cultural or natural);"
XVII.6 The Committee took note of the "Glossary of World Heritage Terms" contained in Information Document WHC-96/CONF.201/INF.21 and expressed the wish that the Glossary be prepared in other languages. XVII.7 The Delegates of Germany and the United States of America made statements as to the legal significance of the Operational Guidelines and the fact that, in their views, the Operational Guidelines had not been applied properly during this session. Both Delegates requested that their statements be included in extenso in the report and are attached in Annex IX. XVII.8 The Delegate of Italy agreed to the strict application of the Operational Guidelines, however, underlined that the Guidelines had been followed and that the Committee itself is the decision-making body of the World Heritage statutory organs. The Delegate of France agreed to this statement and said that it is common practice of the Committee not always to follow recommendations by the Bureau and by the advisory bodies. This was endorsed by the Delegate of Benin. The statement of the Delegate of Italy is included in Annex IX. XVII.9 In concluding the debate which she found constructive, the Chairperson recalled that each one of the delegates of the Committee had made a serious analysis of the case and of the spirit of the Convention before taking a final decision, and that in respecting the statements of each of the speakers, even if she considered not acceptable those of the Delegates of Germany and the United States of America, the Committee had retained its credibility and competence. The statement of the Chairperson is also included in Annex IX.